Absolute Zero are Angelo Angelos (piano, electric piano, vocals), Mervin Naidoo (bass), Stephen Berliner (guitar, flute, backing vocals) and Phillip Meintjes (drums, backing vocals). It's a contemporary jazz band based in Johannesburg, South Africa. "Ballad For Africa" is their second album after their debut "Spirit" (2000). First starting playing covers the band decided to play their own music. Mervin Naidoo said: "Learning other people's music wasn't me. That wasn't what I was about." Asked after the band's name Mervin comments: "This name stems from physics. It describes the lowest temperature at which matter can exist. It means everything is perfect and everything is zero disorder." The group Absolute Zero has developed their own style: "Our music isn't smooth jazz, but there are smooth jazz elements in it. It's multi-dimensional and has more than one rhythmic pattern," explained Mervin. Angelo interjects: "The reason some people describe it as smooth jazz is perhaps because it's laid back. I always like to say we write songs or compositions, not styles or feels. We don’t write a Latin kind of a feel, or a groove feel or a funk feel. Our songs don’t have just one feel or one phrase the whole way through; there are two or three different sections in each song. Our music says a heck of a lot more than what some smooth jazz does!" Bounce starts with Mervin's bass then Angelo's piano, Stephen Berliner's guitar and Chris Luke's sax are jumping in to a slow funky piece. All three are jammin' in broad solos. This tune is something for friends of contemporary jazz with an affinity for improvisation. Salsa is the magical spirit captured in Cigars. Angelo showcases his quality on piano in a Latin staccato. Absolute perfect Phillip Meintjes on drums and Chris Luke's sax has a furious blow. Don't forget the master of percussion Mabaleng Moholo and Mervin's bass injection. Wistful is home for Angelo's electric piano and Stephen Berliner's guitar. Not the melody but the solo is standing in the center of this tune. More in the way of smooth jazz is Paradise Lost with a hooking melody. Stephen elicits mild sounds from his guitar and Angelo's piano play is soft and flowery. Right back to Keller Bar Sessions. The name says it all. Rhythm emphatic is Sidlala No Hlazo. Much Latin drums and percussion are a strong foundation for Chris Luke's extensive sax solo. Cherokee 2 calms down to a nice flute and piano interpreted melody. Destiny is the first vocal piece featuring Angelo's silky voice. A song about the desperate search after the freedom encouraging to actions. Mr. Luke is dedicated to Chris Luke, the sax player. It's a cjazz tune with remarkable free jazz elements. A dreamy epic tune like Space with an atmospheric touch and a string arrangement by Susan Webster (cello) and Heidi Bouwer (violin) is so individually and unique, that you will seldom find it on contemporary albums which are published by labels. Stephen Berliner's guitar is the leading instrument on this track. Song For Peter has a strong Rock character with Stephen's impressive use of distortion guitar. More time for self-contemplation mediates the sustained piece Ballad For Africa featuring Stephen Berliner on flute and Chris Luke on sax. 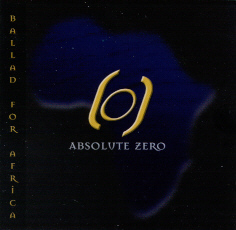 Absolute Zero's CD "Ballad For Africa" is an album for individualists. I hope they find a lot out there.